I just started shaving and I was wondering how often I should change the razor blade? Also, should I be moisturizing afterwards? Posted March 19, 2018 under Ask Us. It’s difficult to know exactly how many days or weeks your razor blade will last as this depends on many factors such as whether your razor is disposable or not, how often you shave, and the type of blade you use. However, there are things that happen when your razor blade is getting close to being ready to throw out. 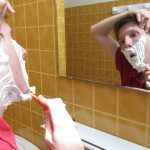 For example, Do you feel you are getting a close shave or does your skin feel rough afterwards? Are you noticing nicks and cuts after you shave? Does the blade feel like it is “pulling” while you are shaving? If you answered “Yes” to any of these questions, you most likely need to change your blade.